Established by the National Historic Preservation Act of 1966, the National Register of Historic Places is the official list of historic properties that have been recognized as significant in American history, architecture, archaeology, engineering, or culture. The Division for Historic Preservation in the Office of Parks, Recreation and Historic Preservation coordinates the National Register program in New York State, as well as the parallel State Register program. The Waccabuc Historic District was approved for listing on the NY State Register in March 2015 and subsequently listed on July 28, 2015 on the National Register of Historic Places. The new street sign, at the intersection of Rt. 35 and Mead Street. The Waccabuc Historic District consists of 524 acres within the hamlet of Waccabuc. The district includes the Enoch Mead family’s landholdings, which developed into Waccabuc in 1780. Waccabuc treasures like the Old Field Preserve, Mead Memorial Chapel and the Post Office building are a few of the “contributing resources” that make up the Waccabuc Historic District. The architecture and landscape has maintained a high level of integrity, without too many substantial changes over several generations. One can walk along Mead Street and still see – and imagine – what it looked like over 100 years ago. The guidelines for properties that fall under the historic district include that they are a minimum of 50 years old, that the properties be contiguous, and the historic features of structures are maintained. The above map shows the boundaries and contributing resources that make up the Waccabuc Historic District. Click to view larger. 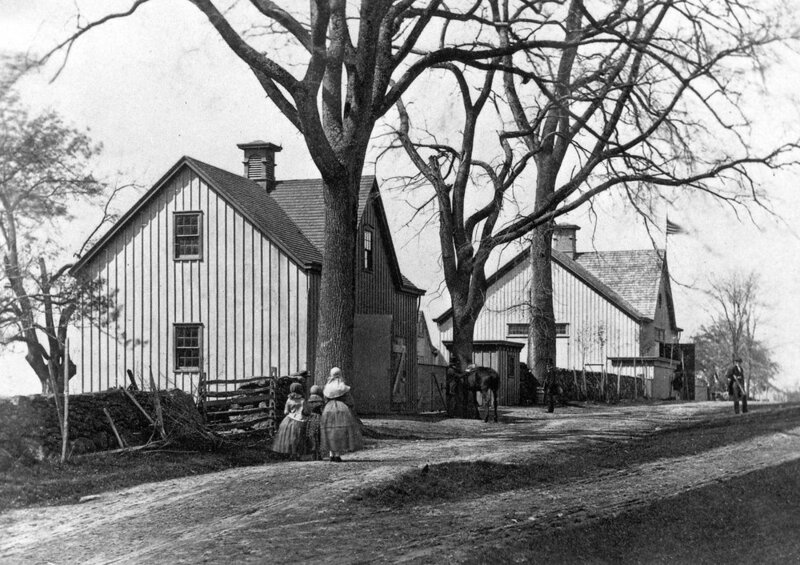 Early Mead Street scene, mid-late 1800s. A final word about the sources for the Historic District section of this website. All historic photos are courtesy of the Mead- Studwell Foundation, Mead Memorial Chapel. All contemporary photos are courtesy of Linda Broudy. The “More About Waccabuc” page lists the various published reference sources that have been used to create the information presented here.